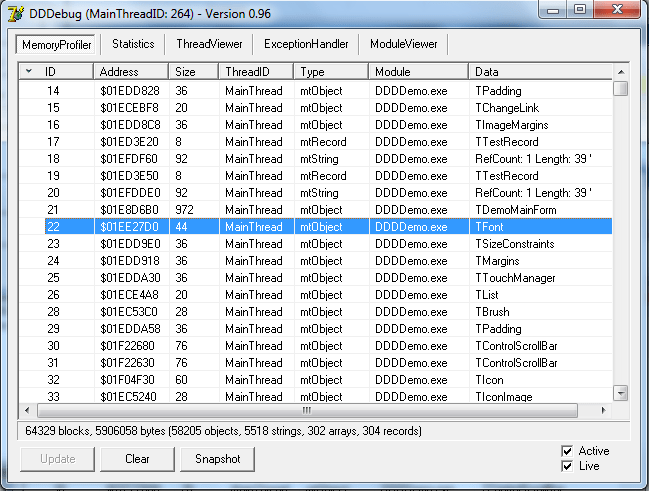 DDDebug is a comprehensive collection of debugging tools for Delphi. DDDebug consists of several modules which cover process-, thread- and exception information as well as detailed analysis about memory management and usage in real time. DDDebug supports Delphi 5 to 7 as well as Delphi 2005 up to Delphi 10.3 Rio (32bit and 64bit). 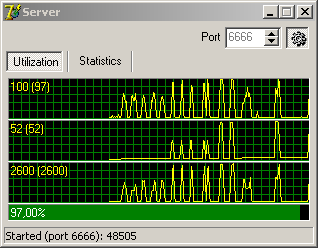 DDDebug makes it very easy to find, identify and remove memory leaks and spot growing memory consumption. Integrate DDDebug in your existing application by adding a couple of lines only and use it within your running application to profile the memory usage, take snapshots, detect potential leaks and show their callstack. DDObjects is a remoting framework to be used with with Delphi 5 to 7 as well as Delphi 2005 to Delphi 10.3 Rio (32 and 64bit) which originally was begun out of personal interest for technologies like DCOM, RMI, Corba etc. A main goal in the development of DDObjects has not only been to keep the code one has to implement in order to utilize DDObjects as simple as possible but also very close to Delphi’s usual style of event-driven programming.